Evidently there’s a lot of Shooty Badness in India today. Had this happened a week ago, I would have been in full freak-out mode, as my parents just got back from their trip to India and Dubai a few days ago. Fortunately, my family is safe and accounted for. I grieve for those who were killed, and hope that the situation is able to be resolved with no further violence. I wish that government policies could be based on the scientific method: gather information, present a hypothesis, test it in a well-defined manner, analyze the results, and see if the hypothesis is true or not. If not, discard the hypothesis and, if needed, formulate a new one. Progress is made by implementing policies based on confirmed hypotheses, and repealing policies based on failed ones. I’m a student of science, and so believe that things should be tested by experiment. However, the consequences of a failed experiment in the lab are very different than those in the real world: in the lab, you might lose your eyebrows, your funding, or maybe your reputation. At the very worst, you might be killed or seriously injured by a spectacular failure, but this is extremely rare. Even if a theory is shown to be incorrect, useful data is generated, a better theory can be crafted, and a new experiment with the same starting conditions can be conducted. The real world is much less forgiving: a policy mistake can cost trillions of dollars and many lives. The realities of bureaucracy and government can take a good idea, implement it poorly, and make things worse. Due to the inertia of society and bureaucracy, some flawed policies can be essentially impossible to undo. Thus, it is extremely important to learn from the past, recognize which policies failed and which worked, make informed decisions, and make policy decisions based on fact and a realistic worldview. Unfortunately, things rarely work this way, and the same mistakes are made over and over again. As a student of science, this annoys me to no end. The NSSF has a handy page talking about “assault weapons”, and how they’re no different than “ordinary” semi-auto guns. The only improvement I’d suggest is that they have links to or otherwise cite the studies they reference. purpose for sportsmen. Silencers are also illegal. From Mass Produced Mayhem, a pamphlet published by the Brady Campaign saying why “assault weapons” are evil and should be banned. This particular part is located on Page 21, as part of a list of “combat features” that certain guns have that “have no sporting value”. While the entire document is pretty much bunk, this particular bit stands out to me due to my ownership of several firearms with threaded barrels and a silencer. Silencers are not illegal. In case the bold print wasn’t enough, let me repeat: silencers are NOT ILLEGAL. They are regulated under the National Firearms Act of 1934 and by state laws. In a few states, ownership or use of silencers may be banned outright, or so heavily restricted that they are effectively banned. However, most states either have very light regulations or defer to federal laws. The process to legally acquire one is the same for acquiring any other NFA-regulated item: payment of a $200 tax, addition to the NFA registry, local police approval, federal (ATF) approval, a detailed background check, a full set of fingerprints, etc. All in all, it takes about a month to get all the paperwork sorted out. That said, what does the Brady Campaign hope to stop if they banned guns with threaded barrels? Hypothetically, if silencers were illegal, what would a ban on threads accomplish? It would already be illegal to own silencers…would making their mounting point “more illegal” somehow reduce the already extremely-rare (to the point of being unheard of outside of movies) criminal use of silencers? Silencers have plenty of perfectly legitimate purposes, both for sportsmen and ordinary shooters. For example, a hunter could use a silencer so as not to alarm other game animals within earshot (thus being polite to other hunters by not scaring away their game). A hunter might also find a silencer useful if hunting in lands that are within earshot of communities, so as not to annoy neighbors. Not needing to carry bulky earmuffs (which reduce one’s perception of the surrounding areas, and thus limit the ability to detect game animals) is beneficial, as well as reducing the risk of hearing damage. Indeed, in many areas in Europe, the use of suppressors is encouraged for sportsmen and hunters for these very reasons. Ordinary shooters find silencers to be quite handy as well: I find them excellent for teaching new shooters, as there is no loud noise emitted when the gun is fired. This allows new shooters to get introduced to the sport without developing flinching and other negative behaviors. Arizona gets quite hot, and earmuffs can make one’s ears quite uncomfortable (hot, sweaty, etc. ), so a silencer is beneficial by making earmuffs unnecessary while keeping noise at safe levels. Many guns are extremely loud, and by using a silencer, I can reduce the noise emitted by my guns, so as not to annoy fellow shooters at the range, those living near the range (granted, the range where I shoot is extremely remote, and nobody lives around it for miles in all directions), and so on. It’s simply a matter of being neighborly. Silencer-using assassins are all but unheard of outside of hollywood movies. Those few assassins that do exist are likely to be trained and operated by governments…governments who don’t really give a damn about (or are exempt from) US firearms laws. While high quality silencers require the use of a machine shop, the knowledge and equipment needed is minimal and an amatuer could construct a workable, durable silencer in the time of a few hours. Threading a firearm barrel is even easier. Flimsy, novelty, less effective (but by no means less regulated) silencers can be made with homemade equipment and no machine shop in an hour or two. That said, this proposal isn’t about the legality or illegality of silencers, it’s simply about their mounting points. I’m curious if such a law, if implemented, would ban the use of quick-disconnect lugs or other non-threaded mounting devices for various muzzle accessories? I was at the range today with a few friends (including two new shooters — post and pictures coming soon), and when we were winding down at the end of the day, we started chatting with a few of other folks at the range. After mentioning that I was, in fact, the blogger in question, the conversation became quite a bit more animated. It turned out that this gentleman was a reader (hi Richard! ), and had emailed me about getting in on some of the group buys for AR magazines. Perhaps it’s not really a small world, as we were both in Tucson, but for having <50 readers subscribed to the RSS feed, randomly running into one is, nevertheless, fairly unlikely. Very cool. Bullets that are slightly flattened on one side by the military’s bullet-puller (used for de-milling surplus ammo) make things exciting. When the seating die is crimping the case neck around the bullet, it can make it non-circular. This causes rather amusing chambering issues, like when I tried to load and fire my very first shot from my new DPMS AR today. Some swearing ensued. A total of three rounds (out of the ~150 fired today) were out-of-round enough to cause a stoppage. Moral of the story: surplus bullets are great for range trips and fun, but do not depend on them for anti-zombie use. Gas is getting cheaper. I approve. Total cost to fill my Camry’s tank: $23. When it was the most expensive here, I was paying about $45. Not bad at all. Let’s see if it goes lower still. As is my habit, I was perusing Fark.com this morning. For some reason, I had Adblock Plus turned off and so ads were visible. 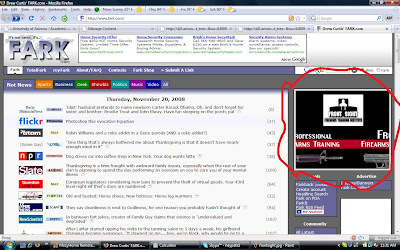 Fark is known for its snarky headlines and goofy comment threads (if you don’t get your newsNot News from Fark, you’re missing out), so I was a bit surprised to see Front Sight ads running in the Google Ad panel there. Very cool. I think that such ads going out to the general public is a good thing: if it helps get one person trained, and saves one life (astute readers will see what I did there), then it’s worth it. I’ve been to Front Sight, and while their “Front Sight Family” stuff was a bit odd and there’s accusations about various financial-related issues, the training was solid. Midway just raised their dealer prices on the AR Stoner 30-round AR-15 magazines I’ve been running group buys on. Prices have increased from $10/each to $13/each, and this will be reflected with all future group orders. I’m still selling them for my cost + shipping (I’m not marking them up at all) if people are interested. At this price, you can get essentially identical ones (AR Stoner mags are made by C Products) directly from C Products for less.